I was only going to Nom a small amount—I SWEARS! You better get a otter lawyer Susan W.! He's so ashamed he's blushing! How BLEENIN' adowabuhls! Me wanna snuggle panda belleh!! Sneezing panda, once a child star, now a tabloid victim. now who could not believe those panda eyes! *darn, not fast enough....* Still wanna nom da panda, though...Paws!!! This is the most insane picture ever! He looks like a mime! OMG he's so cute! Apprehensive-looking, but cute!!! I wonder if there's going to be an interrigeisha. 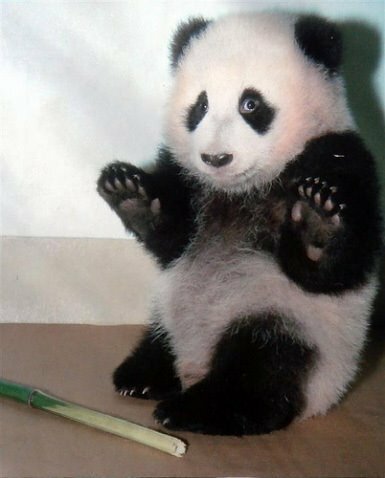 First lesson for KungFu Panda: the bamboo stick is a deadly weapon, not food. Holy morphages! It must be Friday! Thanks Teho, for making Fridays the fun, twisted days they should be! Are you kidding? Was that scripted? YAY, RCF with my two faves, Panda Bars & kitters. Happy IT noid appreciation day, Teho!! Cockney Panda..."Cor, strike er lite guv, yer've cort me bang to rights." Okay, okay! It was just sitting here. I didn't do anything - okay? Hey, take a chill pill or something! It's all cool! ...what does bamboo even smell like? Grass? This is the famous Hua Mei. A female, and the first panda baby born in the Western Hemisphere. She was born at the San Diego Zoo in 1999. In 2004 she returned to China for breeding and has since given birth to 3 sets of twins. Meanwhile her mother Bai Yun remains at San Diego Zoo and is still birthing cute cubbies herself, right now she baby Zhen Zhen. So Bai Yun is a productive mother and Grandmother. Hua Mei has pink patches due to a chemical reaction to her mother syliva which occurs when the mother grooms her cub. Really digging his slightly in-turned toesies. What a cutie-pie. Please find another name for him. References to piddling are more degrading than cute. It's a fair cop, but society is to blame. If she picked that bamboo up, she could be Puttin' on the Ritz! Yay Teho! You know I lurves me some RCF! w00t!! i wanted to see it ever since i've started reading 'the Panda's thumb' by Stephen Gould. Awww, poor baby! LOL! Let him have a nosh! *kersnorfums* Teho I haz hangover from drinkingks after the X-Files movie last night. Mah poor fried... no, sunny-side-up-no-bacon-kthnxbai brain cannot handle dees! This could also be a joyous hand wave a la Wallace. "Bamboo, Gromit!" that's just so cute! it's an old pic used everywhere, but still cute every time! She looks ever so polite! "No, no YOU take the last piece. Really I'm stuffed, I simply can't eat another bite. Go on, I INSIST!"